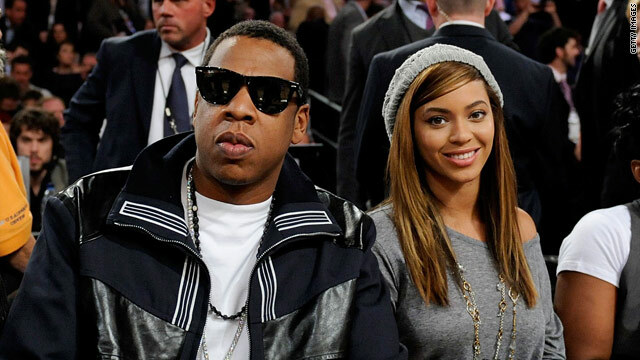 Jay-Z and Beyonce led Forbes list for top earning couples of the fiscal year at $122 million. (The Frisky) -- What makes more than an uber-celebrity who earns millions per movie, album, or TV season? Two uber-celebrities who just happen to be married. Forbes is always giving us a behind-the-scenes peek at famous finances -- don't tell us you weren't surprised by the top-earning dead celebrities -- and their latest list shows the famous couples who made the most from June 2008 to June 2009. Topping the list -- actually, clobbering the list (they made almost twice what the #2 couple grossed) -- are Jay-Z and Beyonce. Together, they banked $122 million smackeroos. Interestingly, Beyonce is the one who brought home the most bacon -- she earned $87 million to his $35 million. Also notable: While this is a massive amount of money, it's actually much less than these two made last year, when they pulled in $162 million cumulatively. So which other couples gave them a run (or halfhearted jog) for their money? It's not who you think. 2. Coming in second place are surprise contenders -- Harrison Ford and Calista Flockhart. They earned $69 million thanks to Harrison's bloated $65 million paycheck for "Indiana Jones and the Kingdom of the Crystal Skull." Suddenly, Calista's $4 million for "Brothers & Sisters" looks weak. 3. Most of you would probably guess that Brad Pitt and Angelina Jolie would be number one on the list. But nope. They earned $55 million total, both bringing in exactly half the loot. 4. Next up, Will and Jada Pinkett Smith, who raked in $48 million. Perhaps they would have done a little better if they counted how much kidlets Jaden ("The Karate Kid") and Willow ("Madagascar") made. 5. David and Victoria Beckham are number five on the list with $46 million between them. Most of it is soccer money, but Victoria must have made a little money for her appearance on "Project Runway." Wonder what she'll get for guest-judging on "American Idol"? The Frisky: Would you donate your eggs for cash? 6. Awww. Adorable couple Ellen DeGeneres and Portia de Rossi made $36 million last year, between Ellen's TV show, those Am Ex commercials, and her stint as a CoverGirl. But Portia isn't just coasting -- she's on "Better Off Ted." 7. Tom Hanks and Rita Wilson are next. Most of their $35.5 million came from his fee for "Angels & Demons." 8. This year, Jim Carrey made the bulk of the household income for himself and Jenny McCarthy. But Jenny is on the rise! She's been tapped by Oprah's Harpo company to have a new show. 9. We're pretty shocked that Tom Cruise and Katie Holmes are this far down the list, making a measly $33.5 million. Only half a mill of it came from Katie. Can she start auditioning for some roles soon? 10. Bringing up the rear: Chris Martin and Gwyneth Paltrow, who made $33 million collectively. Interestingly, Chris is the top earner in the family. But Gwyneth is goopier.